For the exhibition In Constant Circulation at 1708 Gallery, Kristin Cammermeyer returned to the climate of her adolescence with its summer thunderstorms and flickering lightning bugs. 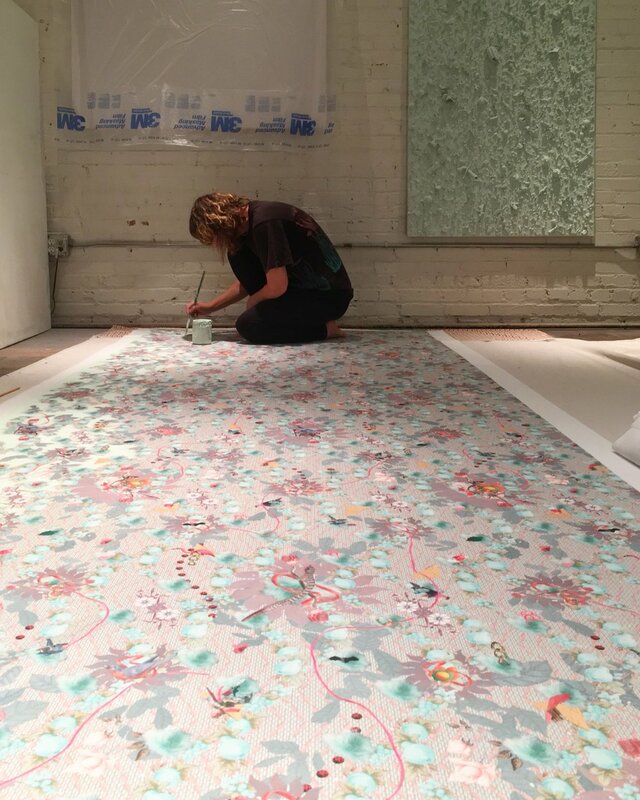 Having grown up in a renovated dairy barn in rural northern Virginia, Kristin’s practice of reusing and recycling materials is deep-rooted. Along with the comfort of returning to this familiar and yet far away place for the current Los Angeles dweller, Cammermeyer was upset to find rapid development and homogenization in her hometown. While in Richmond, she admired grass taking over brick sidewalks and rows of cast iron front porches, in contrast to the concrete desert of Los Angeles. Kristin is constantly analyzing the place she finds herself in through its specific aesthetics, architecture, and debris in order to place it within a larger cultural context. 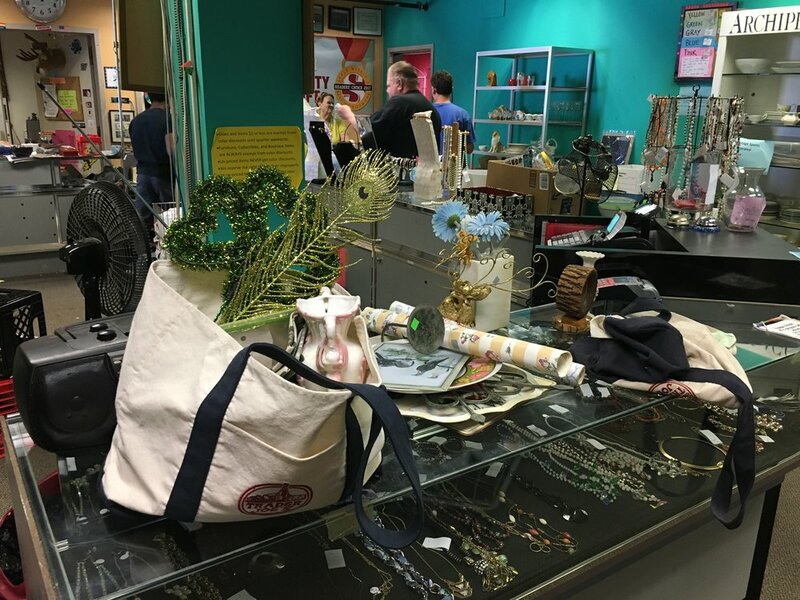 Over the course of three weeks, Cammermeyer created an installation at 1708 Gallery using objects donated by Diversity Thrift in Richmond. 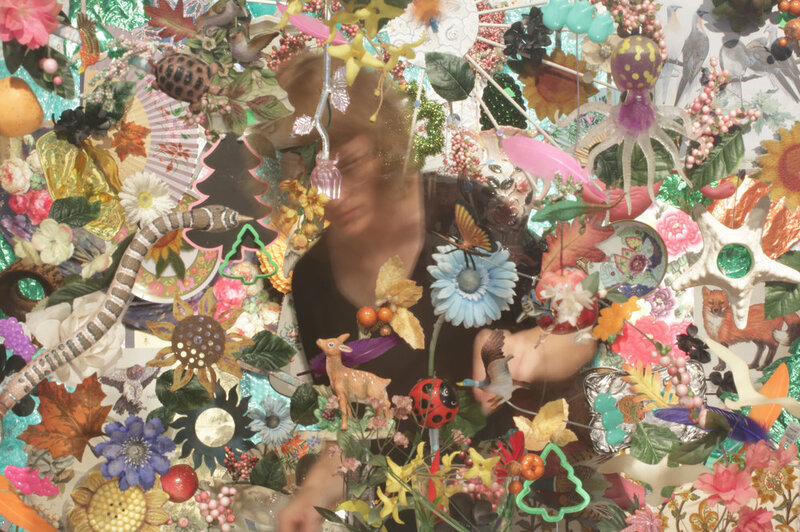 The installation was then manipulated to film a stop-motion animation overflowing with thrifted novelties. The curated collection of objects either reference flora or fauna; a mallard duck figurine, rubber snakes, plastic pink flamingos, and floral christmas decorations are all de- and re-contextualized within a series of layered frames. 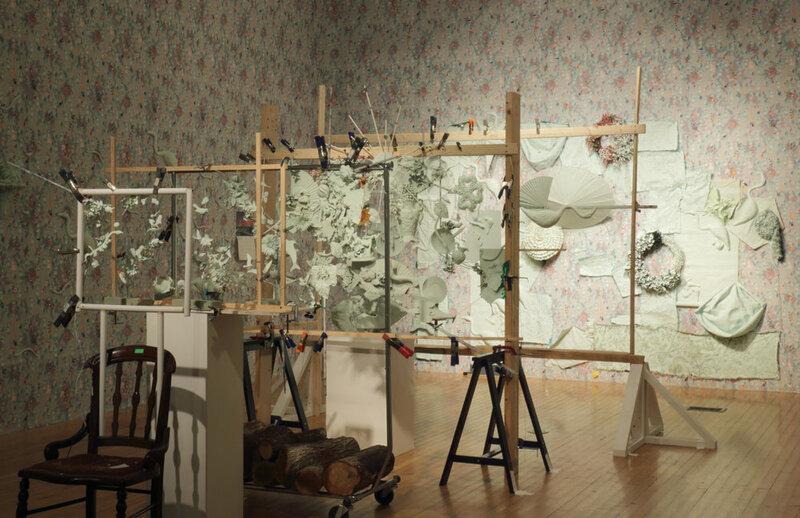 The walls alongside the installation are covered in a detailed wallpaper repeating a faux flora and fauna motif, highlighting the frenzy of accumulation. In the front space of the gallery, panels painted a minty blue tone (appropriately called ‘Spring Valley’) hang on the wall with a uneven and mysterious surface. Upon closer inspection, the viewer discovers small pieces and parts of semi-recognizable objects littering the panel’s surface. A calendar from 1994 titled For Your Inspiration, which includes stock landscape photography with corny inspirational quotes, was used as material for smaller video animations that accompany the panels. With its absurd and highly staged nature photography, the calendar prompts questions of how and why the natural world is curated to achieve the ‘picturesque’. There is indeed something banal that is revealed within the exhibition. The kitschy curated collection within In Constant Circulation reveals our desire as humans to surround ourselves with these consumable objects that represent an idealized, unrealistic, and untouched ‘nature’. In L.A., Kristin is confronted daily with the digestive system of manufacturing, from raw material to urban detritus. City blocks succumb to the waste of production and become vibrant ecologies of synthetics. Watching the animation in the exhibition, the viewer can feel overwhelmed or even suffocated by plastic frogs and fake flowers reversing the roles of consumption and become the consumer. The borders of the frame bleed and it seems as if the projection is only a slice of an expanding ecosystem. Kristin loses herself in animating the inanimate, allowing these discarded things to have a newfound sense of agency. She will continue to give life to these objects in future creations in order to subvert the self-destructive cycle of consumerism. In Constant Circulation is on view at 1708 Gallery until August 4, 2018. Hannah Bates is an artist and current graduate student in the Craft/Material Studies department at Virginia Commonwealth University. LookHERE: Do You See What I SEE? The Gift of Art.